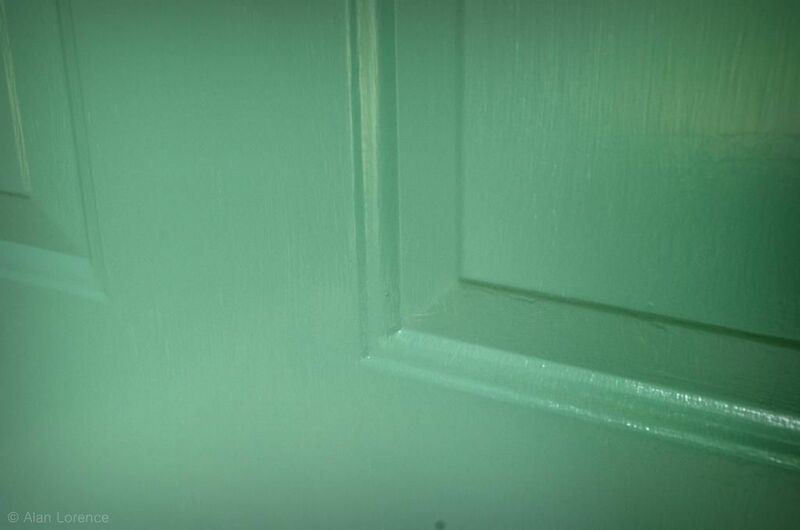 Since the front of the house just got a bit more exciting with its new door color, I've been looking at the rest of the front yard with a critical eye and found the ugliest part of it. It's the bed under the maple. 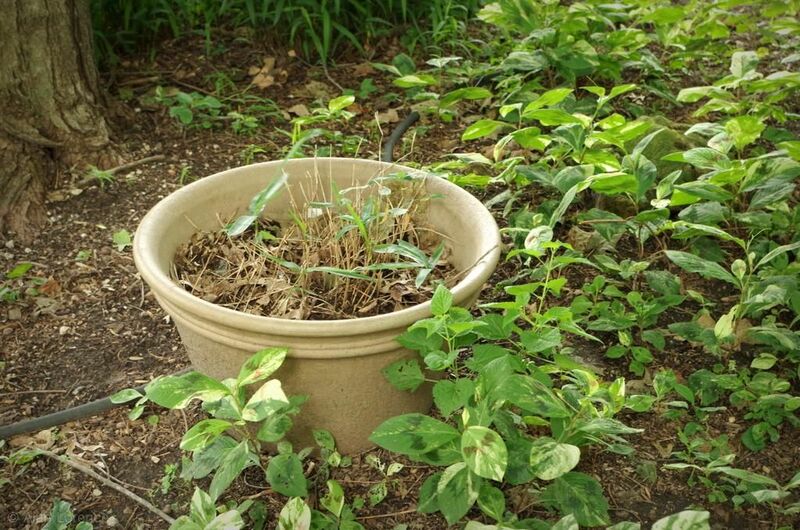 I half buried these pots a few years back in order to give whatever is planted in them a chance to thrive -- the soil under the tree is always so dry due to the greedy maple roots. You'd have a difficult time looking at the front of my house and convincing me that it's not colorful, at least during the growing season. It depends where you look though, and this weekend I finally fixed a long overdue problem. 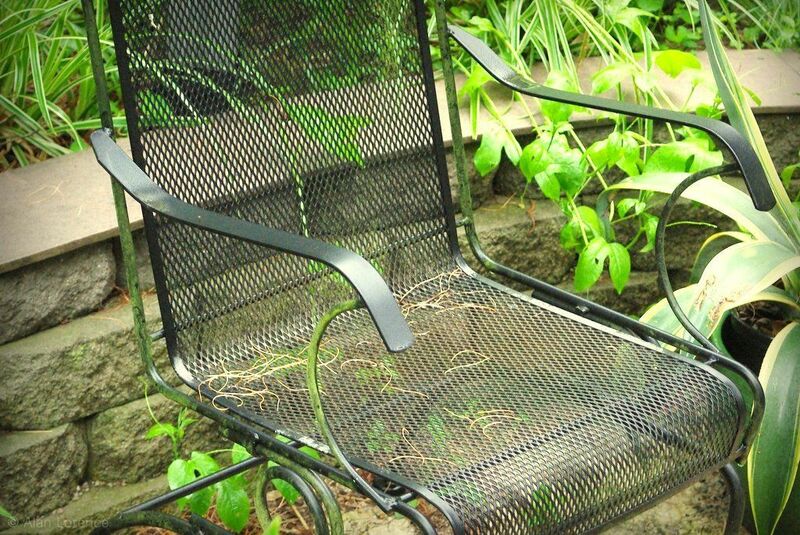 A little over a week ago I did my patio chair makeover test, where I covered a bleh metal chair with cedar to give it new life. At that same time I started another project that although was smaller in scope, it took a bit longer. Our small tiled table on the deck (which I built several years ago and updated in 2011) did not make it through the winter (I really should have covered it), and sort of disintegrated. No worries, I have a quick fix in mind! 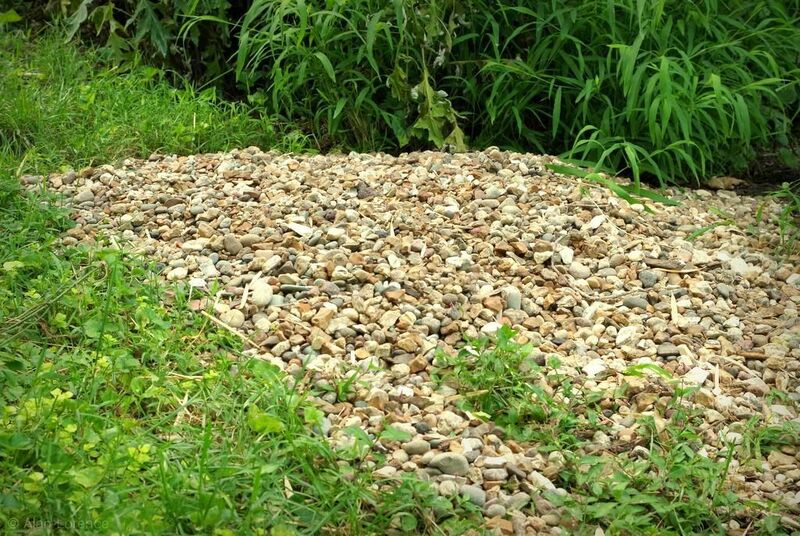 After a week in which we received somewhere around 6" (15cm) or more of rain here in St. Louis, I now have a gravel pile in my garden. Of course I did not plan on having this feature, nor do I really want it. It is what has become of a good portion of my new dry creek bed. 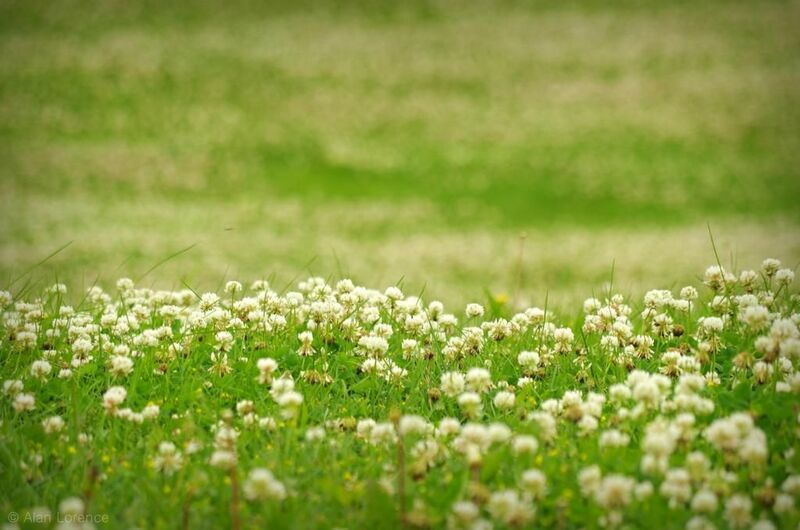 What do you do when you see a field of clover on a cool, early summer day? 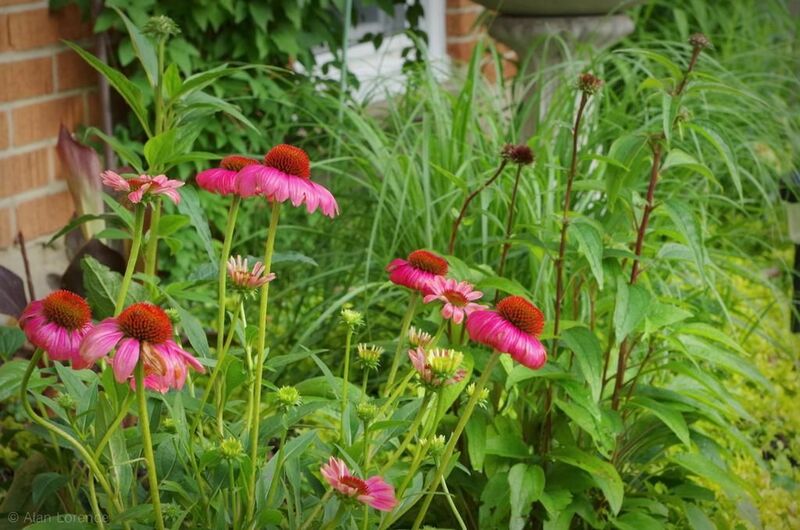 I've been visiting my ill mother in Chicago quite a bit since last autumn, and this past weekend I finally got to see her garden in late spring/early summer form. I finally gave in and replaced my 7-year-old entry-level DSLR (Pentax K200D)! The replacement arrived yesterday, so this morning I went outside early to give the new entry-level DSLR (Pentax K-50) a bit of a workout. It's cloudy (of course) and dark, so I wanted to see how this model would perform. I have a confession to make. Something, as a gardener, that is difficult to admit. It's been raining every day -- including Sunday which was tour day -- with no end in sight. 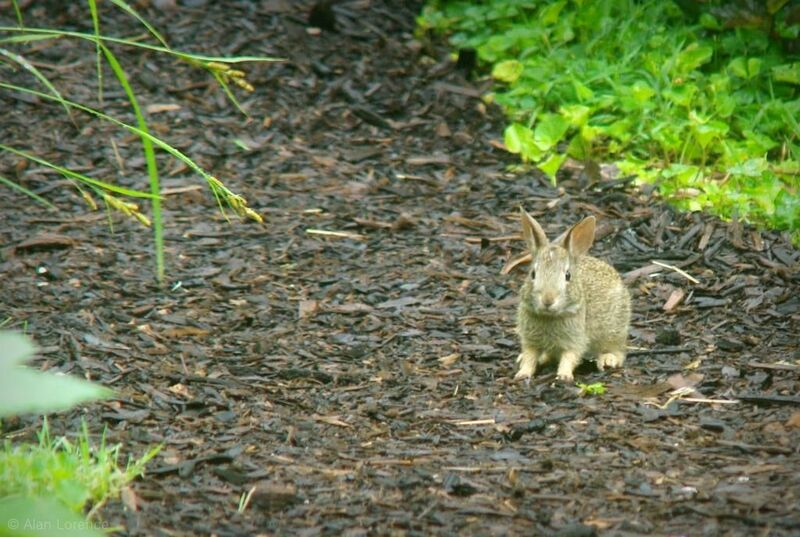 Besides the more worrying consequences like flooding, this means not much gardening going on right now. Which is probably a good thing since I packed a week of work into two days before the tour. But that means that I get to riff again today, my thoughts jumping all over the place. 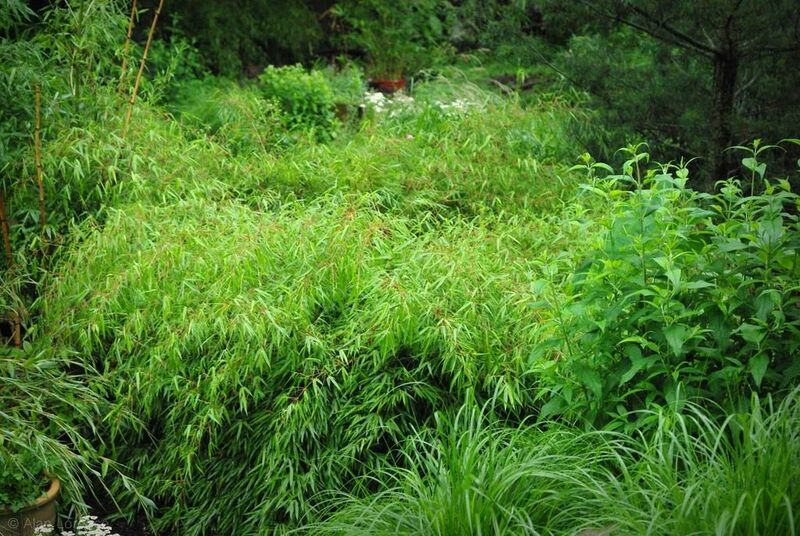 I'll start with a lament about rain-flattened plants like the Fargesia 'rufa' above. 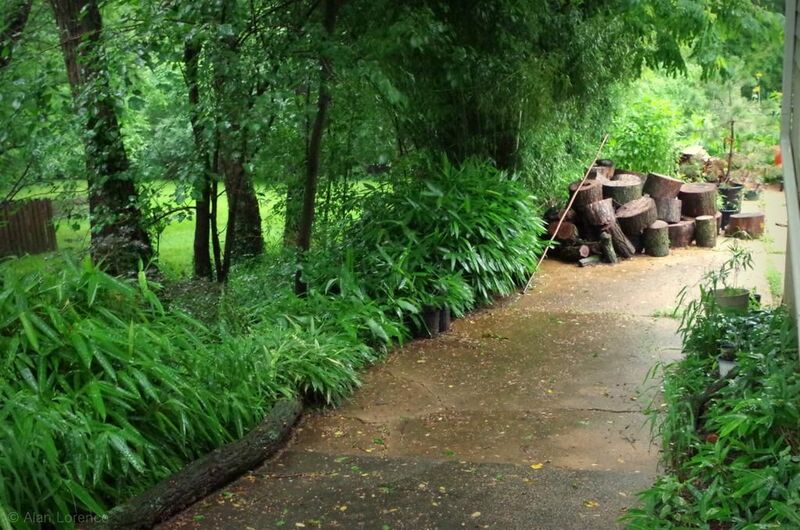 Looks great when it's dry, but it is a big floppy mess when wet. We've had these relatively inexpensive metal chairs for eight years or so now, and although they're fine, they're not perfect. Recently I had an idea of how to make them better and I gave it a test this weekend. 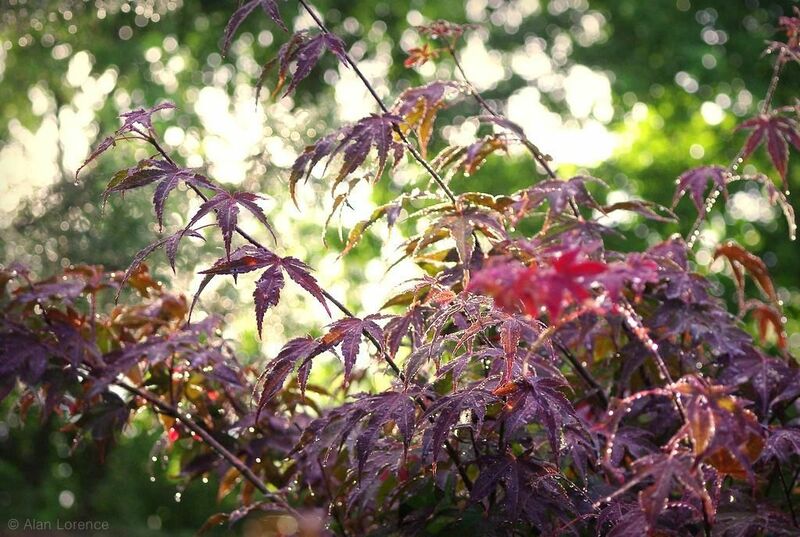 I know I've done this recently, but I have to get out into the garden and do some planting before the rain moves in, so just miscellaneous views of things that caught my eye this morning. 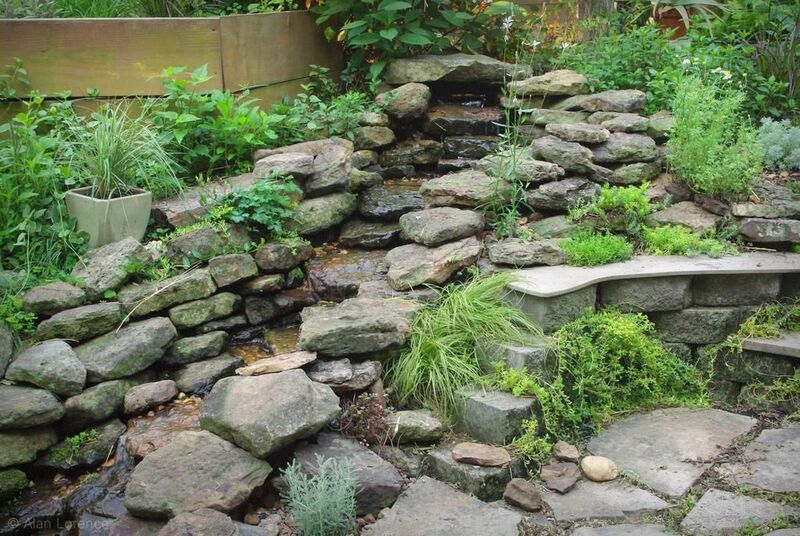 Think of this as a little preview of some of what you'd see if you visited my garden this Sunday on the free Sustainable Backyard Tour. Give them sun! Or not? This post has multiple purposes. First, to showcase my potted succulent collection, which I only acquired during the last 9 months. Second, to ask an important question. 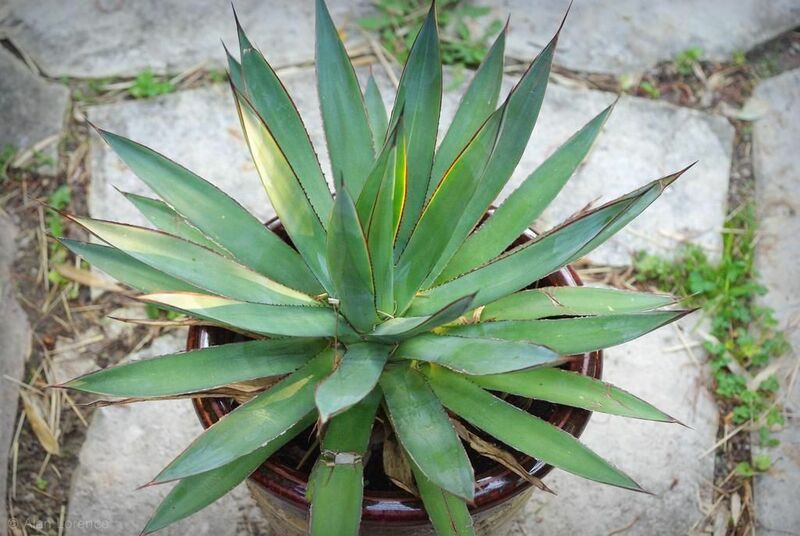 Agave mitis var. mitis? or Agave 'Burnt Burgundy'? Actually, I'll tackle the second part first. Do all agaves want as much sun as they can get? 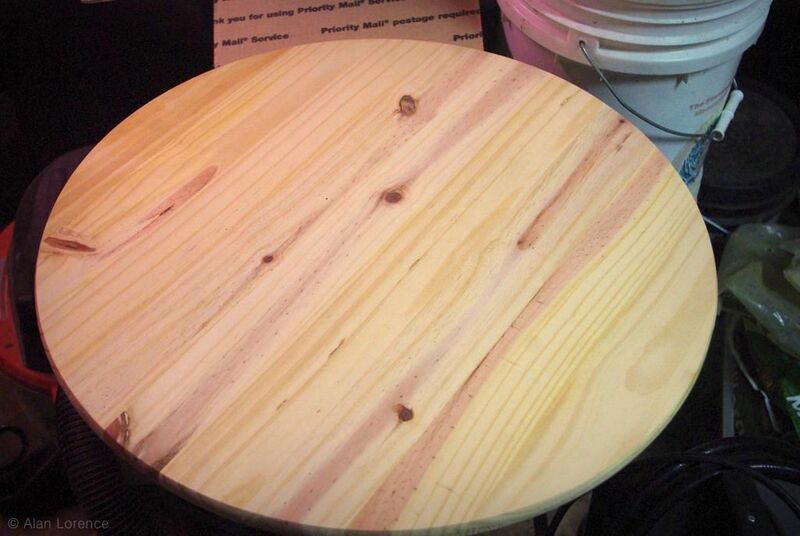 I'm quite happy with the progress I'm making on my list of projects for this summer. Thanks to Peter who convinced me that I didn't have to rebuild the entire thing but could probably just revamp it quite easily, the stream is now flowing again! It had been silent and dry since the early winter, as I was certain that I needed to dig the channel deeper to keep it from leaking. I have a relatively small garden for edibles, needing to fence it to keep out the trio of volunteer pruners that are daily visitors to my yard: deer, rabbits, and woodchucks. These animals seem to love a challenge, and it's not uncommon for one or more of them to overcome my defenses and help themselves to our food -- I saw this earlier in the year when my lovely beets were devoured in one sitting by a less-lazy deer, or maybe it was a woodchuck. 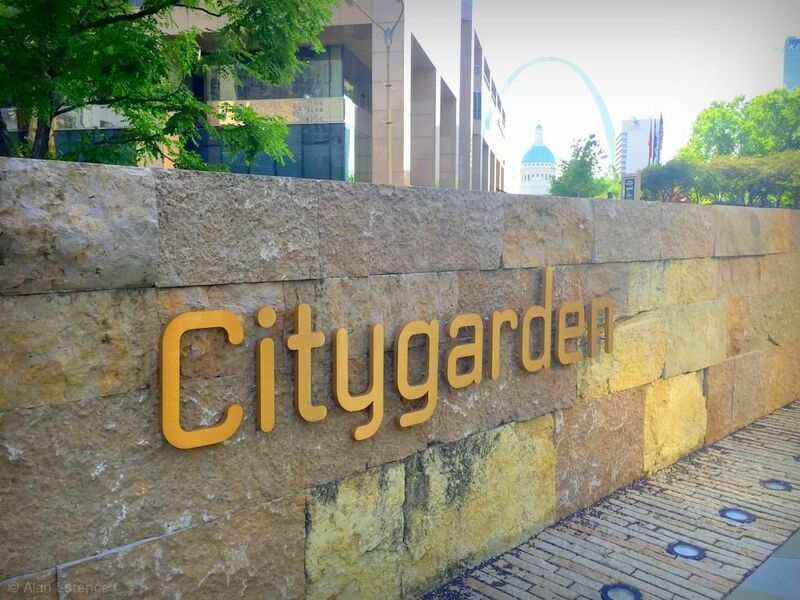 Yesterday morning after a great breakfast in downtown St. Louis my wife and I drove past Citygarden. Sitting at the stoplight with the highway onramp visible directly in front of us, we decided that a stroll around a garden that neither of us had set foot in before would be a good thing. We both knew that Citygarden was only a few years old, contained sculptures, fountains, and plants, but that's about it. Sure we had seen photos of some of its features, but that's not the same thing, is it? 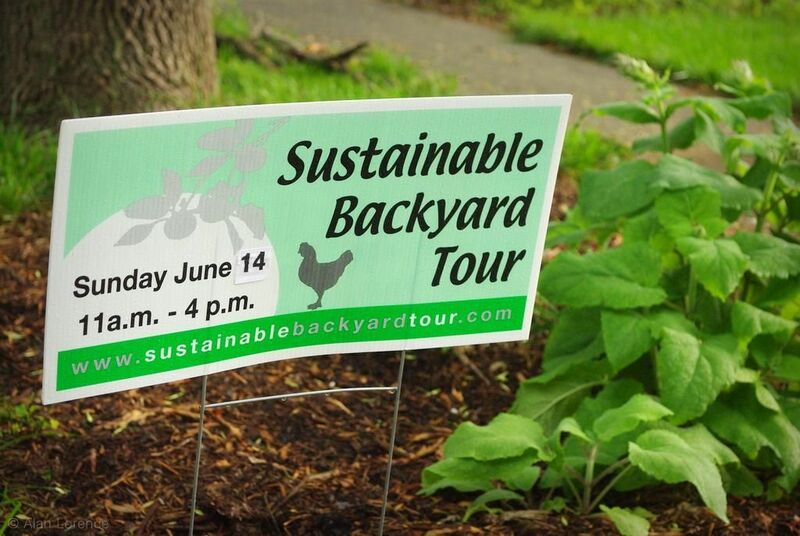 It's almost time again for the Sustainable Backyard Tour in St. Louis, which is just a little over a week away (next Sunday, June 14th). This will be the second year that my garden is part of this free tour, which focuses -- as you might guess -- on sustainable gardening. 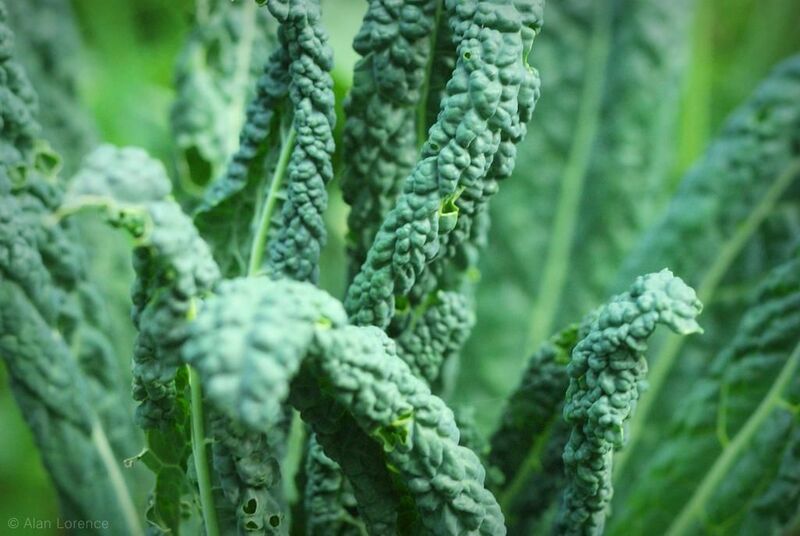 Although what is "sustainable" in gardening isn't always clear (for instance growing food in some climates or even at certain times of the year takes a lot of municipal water) in this case it means growing food and more. After the draining fawn encounter of the last couple of days (which didn't end well I'm sorry to say), I need to do something easy today, so I just walked around with the macro lens. 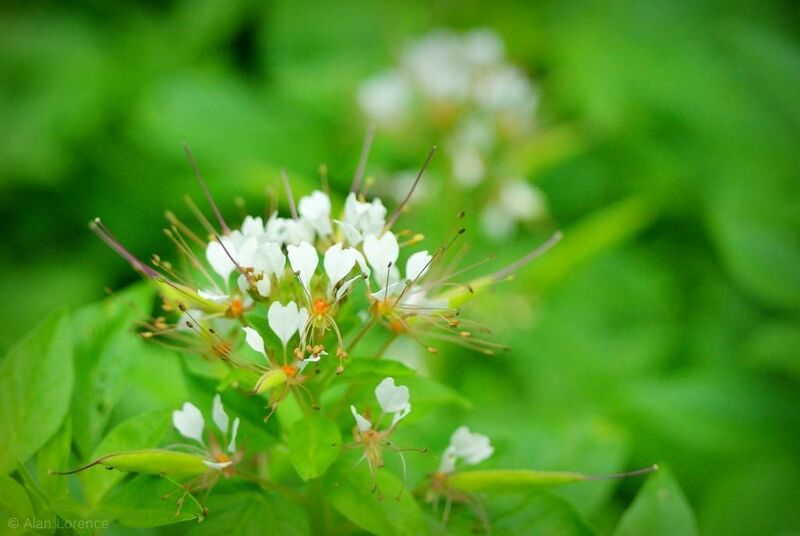 More random tidbits today then, after an unexpected early morning shower -- they had predicted no rain until tonight. 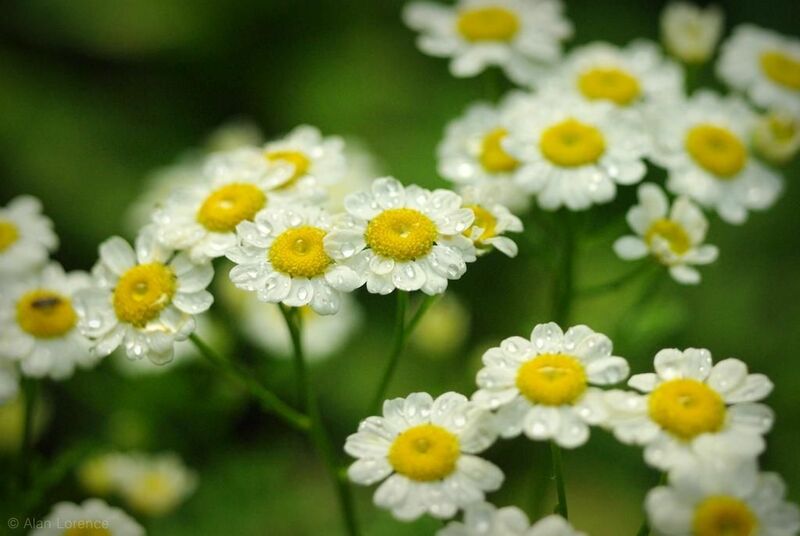 The feverfew is starting to bloom, and the moistening made them even more pretty. 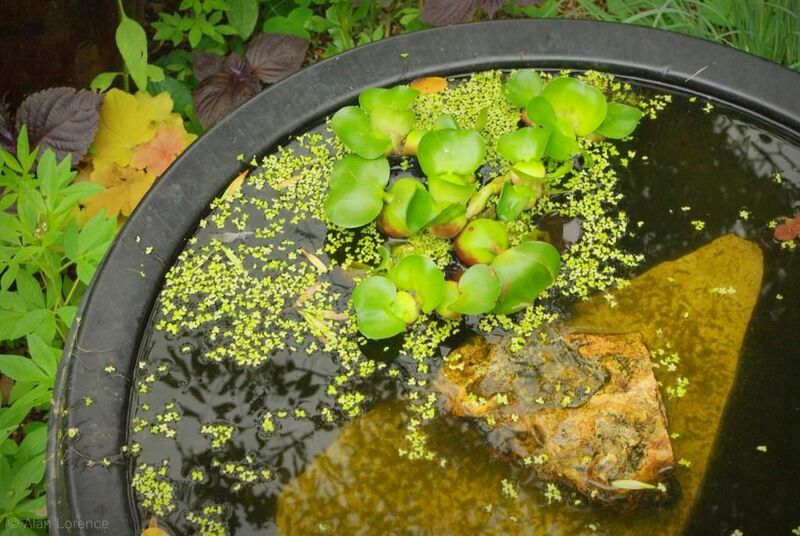 Pretty, but pH is off I think based on the color of the the floating frogbit which you can just see a leaf of at the right edge of the frame. It should be green, not red. 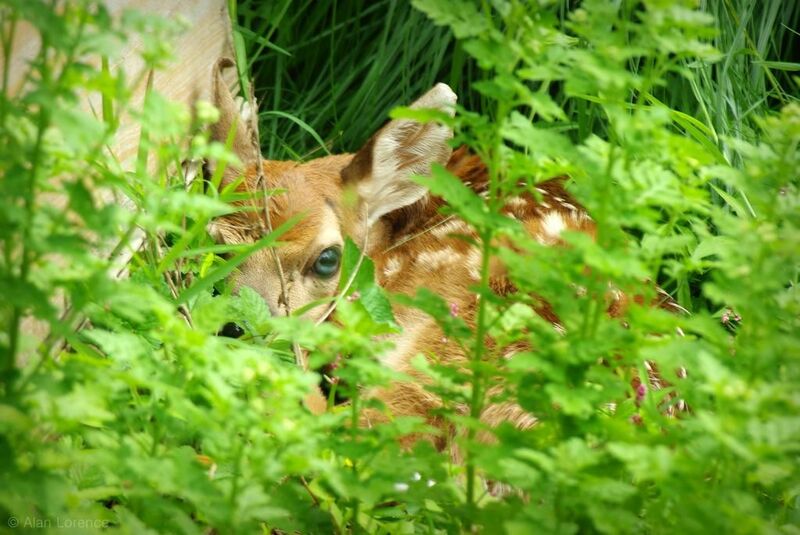 Hiding in plain sight: fawn! 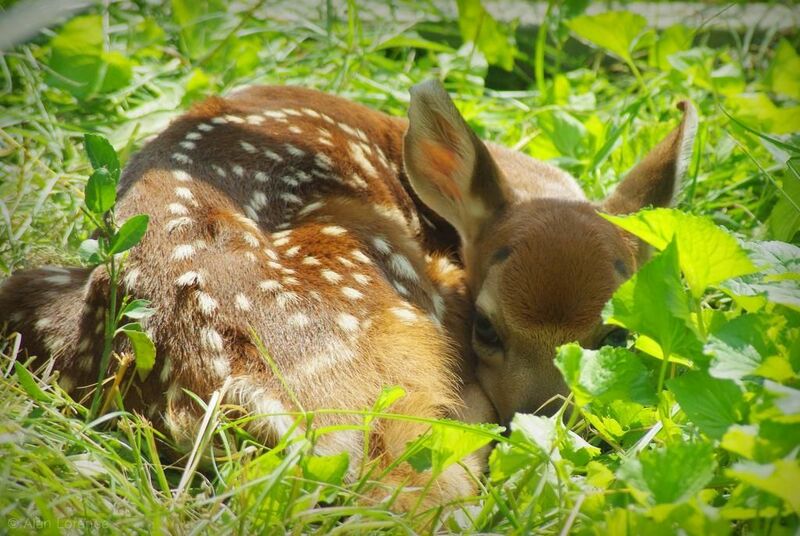 ...when mother deer decide that your yard is a safe place for a nighttime delivery and leave a fawn or two "hidden" for the day.